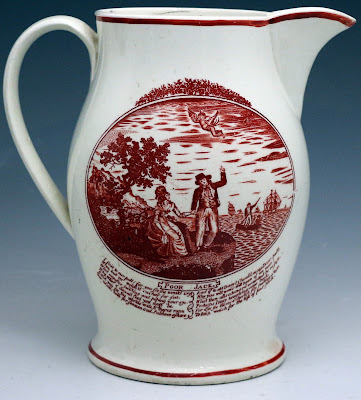 English creamware jug transfer 'Poor Jack,' artist unknown, c.1787, Online Galleries. You can buy this one for yourself over at Online Galleries! It's an original double sided creamware jug with red transfer on both sides. 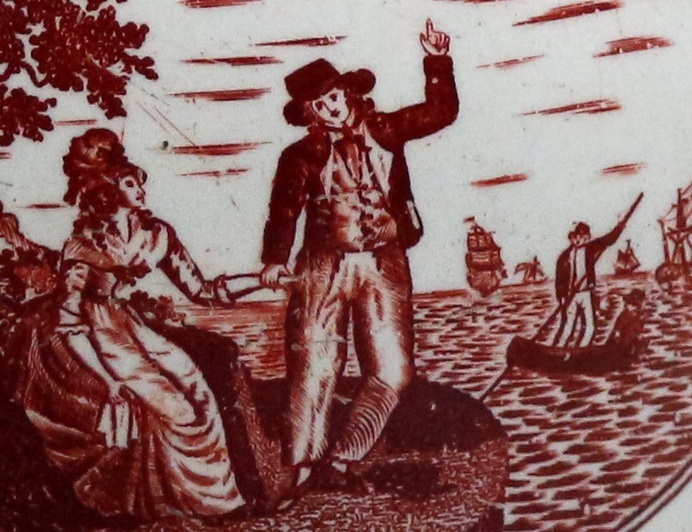 The opposite side (not pictured here) is based on a Cleveley painting that made its appearance in 1787, thus the estimated date. The artist of this piece uses the tried and true 'Sailor's Farewell' trope, depicting a well dressed mariner saying goodbye to his weeping love as a boat comes ashore to fetch him. The sailor at center points to an angel overhead in saying his goodbyes. 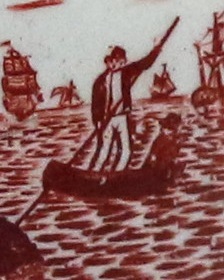 An oarsman in a dark jacket and plain waistcoat over trousers. Atop his head is a round hat with tall cylindrical crown and narrow brim. Jack wears a similar round hat. At his neck is a narrow black neckcloth that hands over his single breasted waistcoat and a dark jacket with white lining. His trousers are plain white with a fall front. A Sailor's Life for Me - This Weekend!